Is there anyone who does not enjoy cabbage in some form? This simple, peasant food can be presented in so many ways that it's truly universal. 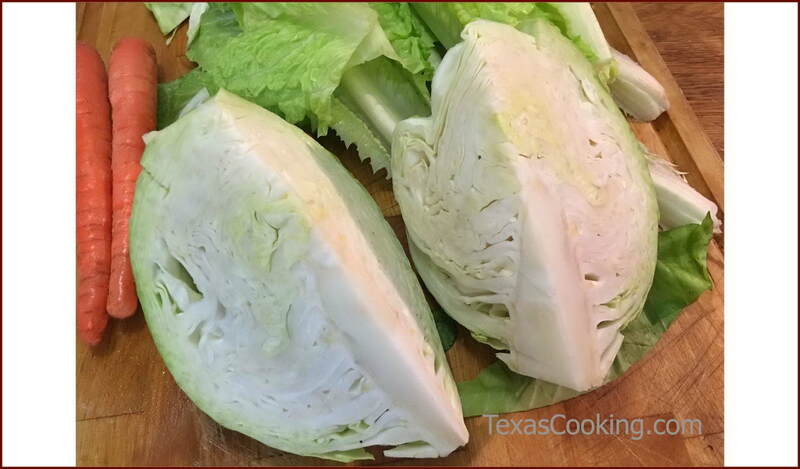 The word cabbage comes from the French, "Caboche", meaning head. The root word for cabbage in several languages goes back to the Celts. They are generally given credit for popularizing cabbage and Michael Flatley. The cabbage family includes Brussels sprouts, cauliflower, broccoli and kale. The various varieties of cabbage that have developed over the years can be green, white, red/purple, tight headed or loose headed. It's all cabbage under the bridge. Cabbage is very nutritious. My earliest memories of cabbage go back to Mama boiling cabbage for several hours until the whole house smelled of it. All she added was a little bacon grease and salt. I never found her cabbage appealing at all. Once in a great while Mama would make some coleslaw. Now, I liked coleslaw even less than boiled cabbage. The mayonnaise it contained just turned me off. I don't think I ever ate any cabbage until I had to get out and make a living on my own. At the barbecue cafes, I learned to like the coleslaw served with the plate. I really don't remember when or why I converted to a cabbagephile, but now I like cabbage every way I've tried it. My favorite is wedges of cabbage cooked in with my should-be-famous pot roast. My German heritage demands I talk about our sauerkraut. Sauerkraut is nothing more than fermented cabbage. I remember our little kid's song, "Where was Herman (or Fritz or Hans) when the lights went out? Down in the cellar eating sauerkraut." It never made number one on the hit parade, but we liked it. I know you already have your mouth set for some cabbage, so let's have a few recipes. This is another Dutch oven recipe that can be prepared over campfire or at home in the oven. Scrape any bone dust off the chops. Trim excess fat. Season with salt and fresh black pepper. Dredge in flour, shake of excess and brown in oil in Dutch oven. You may have to do two or more batches depending on size of oven and amount of chops. When all the chops are browned, pour the oil out of the Dutch oven and cover the bottom with one or two cans of sauerkraut. Layer in the browned chops. Cover with more kraut. On a campfire, cook with most heat on top for as long as it takes to get the kraut to start to brown on the edges. In the oven at home, bake at 325F degrees for 1-1/2 to 2 hours. Check after about an hour to see how things are coming. The chops will come out falling apart tender and tasting line Heaven itself. [Author's note: I find the kraut just a tad sour for my taste, so I add about a teaspoon of sugar to the kraut before baking. Pull the outside leaves off a head of cabbage. When you get past the ragged leaves and the head is clean and smooth, cut the head into quarters through the stem. Cut out and discard the tough, white stem. Put the quarters in a suitable pot with lid. Add enough water to nearly cover the cabbage. Add about a half-teaspoon salt, same amount black pepper and two tablespoons bacon drippings. Bring to a boil, and cut the heat back to a slow simmer. Put a lid on and cook until it is as tender as you like it. A half a head of cabbage will make enough slaw for the whole family. I usually use about a quarter head for my personal use. That much will last me several days. Shred or chop the cabbage. Some like it shredded fine some prefer a rather course chop. A food processor will make fine shred in a hurry. Some folk like to include a little carrot for color and a little onion for an extra flavor boost. It's optional. I'm sure I didn't invent this, but I'm the only one I know who has actually cooked it. In a large mixing bowl, toss the egg with the cabbage and onion. Salt and pepper. Mix in cornmeal, a little at a time, until the mix will stick together. Pour the mix into a well-greased, hot skillet. Spread around to form a large patty. Fry until the edges are brown, turn, and fry the other side until it's brown also. Turn onto paper towels to drain, and serve hot. You can also stir-fry cabbage. Use a wok or wok-type pan and stir-fry the cabbage with a little onion and some bacon drippings until it is tender. Very good. Here's one we really enjoy around the compound. Carefully remove whole leaves from the head of cabbage. It may work a little easier under running water. You will need about a dozen leaves. Put the leaves in a pot large enough not to crowd them. Cover with water, bring to boil, cover and remove from heat. In a mixing bowl, mix the hamburger, onion, pepper, cracker crumbs, rice, salt, pepper and the juice from the can of tomatoes. If the mix seems too dry, add a little tomato sauce. Form mix into a ball. Select an ovenproof bowl just a little larger than the ball of meat. Drain the cabbage leaves and carefully line the bowl with them, starting at the bottom and letting some hang over the edges to the outside. Place the meat ball in the center of the cabbage leaves. Lap the leaves that were hanging over the side over the top of the ball. Add more if needed. Carefully arrange the diced tomatoes on top the ball. You may not need all of them. Set the bowl in a roasting pan with enough water in the pan to come about half way up. Pop in a 325F degree oven. Bake, uncovered, about 45 minutes. Then, if you have cover for the pan, put it on. If not, cover the bowl with foil sealing the edges. Continue to cook until interior temperature reaches 160 degrees. Let set 20 minutes or more before serving.